Open Auditions: Wednesday, June 12, 2019 and Thursday, June 13, 2019 at 7 p.m. Please prepare a 32-bar cut of a song in the style of the show. Callback materials will be provided. There will be a dance callback. Please dress accordingly. September 27-28 @ 8 p.m.
October 4-5 @ 8 p.m.
October 6 matinee @ 2 p.m.
October 11-12 @ 8 p.m.
We will rehearse Sundays (time tba); Tuesdays, Wednesdays and Thursdays (7:30-10 pm). ​Chess is a rock opera with music by Benny Andersson and Björn Ulvaeus (ABBA, Mamma Mia) and lyrics by Tim Rice (Aladdin, Evita). The musical dates back to a 1984 concept album, with staged productions in London in 1986 and New York in 1988. 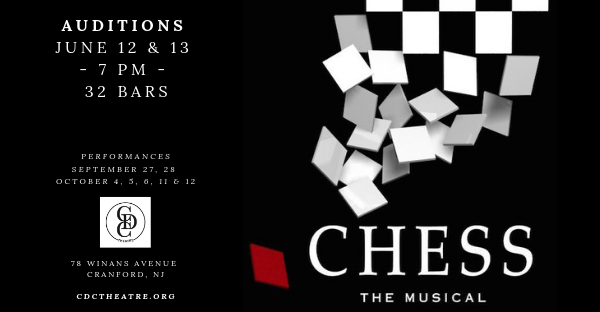 We are producing the London stage version of Chess, with the addition of “Somebody Else’s Story” from the New York/Broadway production. In Chess, the game of chess is used as a metaphor for romantic rivalries and the US-Soviet rivalry during the Cold War. The main characters form a love triangle: Freddie, the ill-mannered American Grandmaster, Anatoly, the intense Russian champion challenger, and Florence, the passionate Hungarian-American female chess second. Florence arrives at the international chess championship as the chess second to the American but falls in love with the Russian. From Merano, Italy to Bangkok, Thailand, the main characters, and the politicians and spies around them, all struggle to get the upper hand.